Introducing ComfortWood a new #Etsy shop! I grew up in a small town in North West Washington and have always been drawn to creating and building. Wood has always been my favorite medium, and that could be from my love of the outdoors and nature and from the time spent with my father in his shop. I learned to woodcarve in the Scouting program when our common saying was, “It’s not a campout unless someone bleeds” …and that person was usually me. To me, I always imagined that that carving had always been there, I just needed to find it…I needed to release it. It’s very exciting and daunting to realize that I am only limited by my imagination. In 2012 we moved from a tiny apartment to our first home. We looked around at our blank walls and our blank rooms with the excitement of a child in front of a clean easel. We pretty quickly became disappointed at the quality of the furniture we found and how much it just didn’t fit into the room design. The ability to customize our furniture meant that we could customize our home. We started building side tables, coffee tables, 3 ft. woodburned wall clocks, columns in our home, massive floating shelves and anything else we could think of. At that point we started getting requests for custom things from our friends. “I want one exactly like that! Except can you change..?” Each person came with their own ideas and vision. It is immensely satisfying to catch the vision of another person. This was perfect timing because unless you’re a hermit in the woods, you can only have so much wood furniture in your home…so we started building for others. That’s when we decided to open ComfortWood. Our shop has been open for more than a year now and it’s just as fun as when we started. When we create something we have a vision of how it fits into a home environment, but that doesn’t matter as much as how the customer wants to use it. 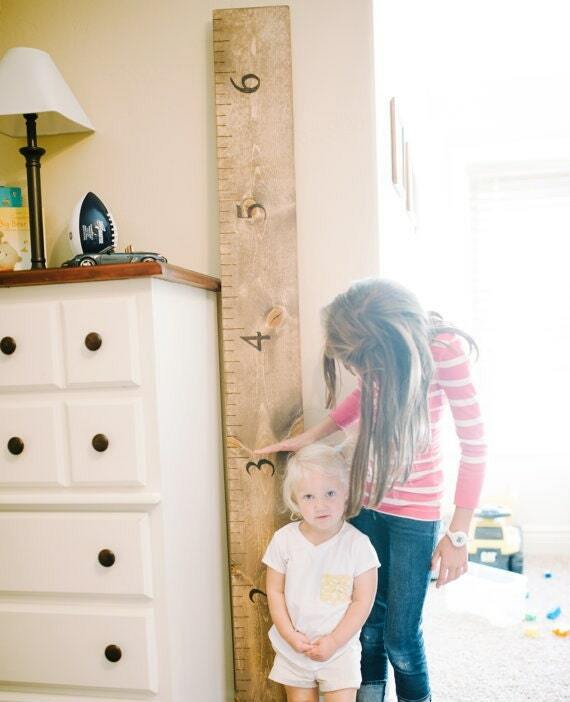 The growth charts have been by far the most popular. Growing up, my parents used a left over piece of baseboard to mark our heights. Just this summer we spent time up in Montana and transferred over all of the baseboard marking onto one of our growth charts. Because we were in the middle of a family reunion, we were able to mark all of my siblings on the left side and measure the grandchildren on the right. Our boards are made from solid wood (not from baseboard J) and all of the numbers, dashes and custom additions are all woodburned. That means that they will never peel or rub off. A nice finish allows cleaning (from that 2 year old that found that one crayon under a couch) as well as a perfect surface for even fine tip sharpies to help maximize your space. I have browsed through their shop and the things they have up so far are absolutely beautiful. I can not wait to see what else they can come up with! Right now Gluten Free for Jen readers can receive 10% off anything in their store by using coupon code GLUTENFREEFORJEN at check out! So head on over to https://www.etsy.com/shop/ComfortWood to order and be sure to follow them on Instagram to get sneak peaks at any new items (like the beautiful table they have pictured)! This entry was posted in This and That on July 30, 2014 by Kandi. I love the idea behind this. The more rustic the more natural beauty. I’ll be sure to keep an eye on what products they have. We’ll be moving soon so I want the rooms to have a new look. They have some really pretty items!